The digital business records in Uganda have hit 70% as the registration process continues , Mr Bemanya Twebaze, the Registrar General of the Uganda Registration Services Bureau (URSB), has said. “The year 2017 started on a good note at Uganda Registration Services Bureau with digitalization of the Registry records in order to transform how we do business,” Mr Bemanya says. According to the Registrar General, the digitalisation process is formalizing businesses in the informal sector as part of the interventions to help maintain a stable and predictable macro-economic environment in the country. The future integration of these online services, with services of the other agencies will ultimately result into a seamless service to the public and the private sectors, Mr Bemanya noted. “As we harness the opportunities to serve better, we will continue to implement the institutional reforms aimed at increasing public service efficiency and reducing the cost of doing business so as to improve responsiveness towards the private sector needs,” he adds. Mr Bemanya says online registraion of businesses has changed URSB operations. For instance, he says, file retrieval is done in 30 minutes as compared to the previous 3 days, while the number of days to register a business has reduced from 30 days in 2014/15 to 8 working hours. 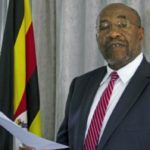 There has also been an increase in non-tax revenue collections per year from UGX 5 billion in 2010/2011 to UGX 24 billion in 2015/2016, and with a projection to increase further, he says. He says URSB has started using a mobile registration services van to reach more clients in the countryside. The van is already traversing the country, covering places where the bureau does not have physical presence to conduct both onsite registrations and sensitization, he adds. 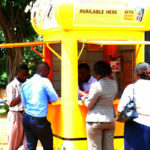 URSB currently has regional offices in Gulu, Arua, Mbarara and Mbale while Kampala residents accesses services from the Headquarters on Georgian House, and three other offices; at Post Office Building, UIA and in Nakivubo on Ssekaziga House. 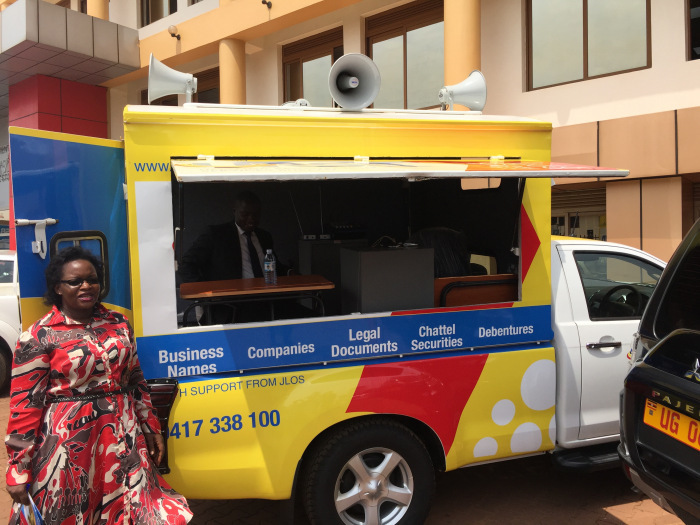 Rachel Odoi-Musoke, the Technical Advisor JLOS, says of the importance of the mobile registration van. “Our wish is to see that registration services reach every sub county and parish in the whole country,” she says, adding that the initiative will enhance the investment climate in the country. As for Mr Bemanya, the van will enable URSB to reach some of the hard to reach areas in Uganda. “While we are already digitalizing our registry and services, we acknowledge that not all our clients are ICT complaint, so we must reach where they are,” he says.